"The Pillar of Heaven 擎天之柱 (qíng tiān zhī zhù) "
The ultimate Decepticon. An idiom that describes him best would be "don't judge a book by it's cover". For the readers unfamiliar with the story, this geeky, nerdy scholar that looks like he cannot survive a papercut is the person who is responsible for the death of Liu Bei 刘备. He used his scholarly persona to trick his enemies into putting their guard down. This was used to great effect in Sun Wu 孙吴's capture of Jing Zhou 荆州, which resulted in the death of Guan Yu 关羽. Two of the biggest names in the Kingdom of Shu Han 蜀汉 owe their demise to this kid. Geeks rule! When you become the target of STEAL 顺手牵羊 or ACEDIA 乐不思蜀, these cards are nullified. 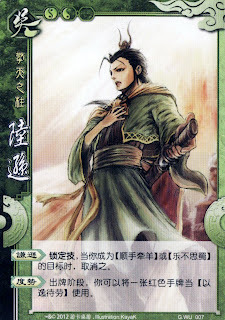 Character ability 2: "Scrutinize 度勢 (duó shì) "
During your action phase, you can use a red on-hand card as AMASS 以逸待勞. The ability description for "Humility" has been changed from “cannot become the target of... ” to “... cards are nullified”. 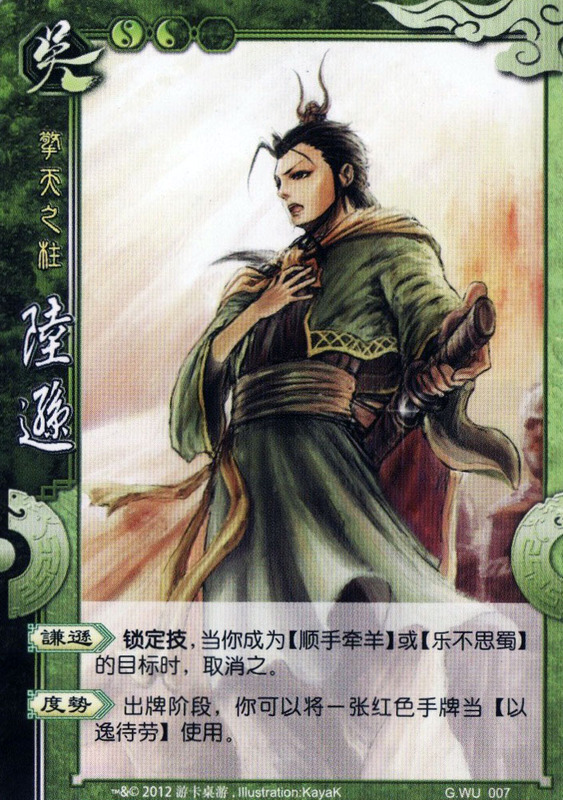 “One after another”, his signature ability, has been replaced by “Scrutinize”, which turns Lu Xun from a highly independent character to a support character. "Humility" describes Lu Xun's careful management of his troops and his unwavering focus on defeating Shu Han. I suppose that the reason he cannot be targeted for STEAL is to imply the opposite of a careless, arrogant leader. As for ACEDIA, it made sense that he cannot be targeted since Lu Xun's patience and focus on defeating Shu Han clearly destroys the meaning of that tool. “度勢” literally means “scrutinize the situation”, and refers to Lu Xun’s prudent action at the Battle of Yiling. When Liu Bei invaded the Wu Kingdom to seek avenge for his sworn brothers, Lu Xun was assigned the Commander-in-chief. Seeing the weakness of Shu troops, he ordered the Wu troops to defend and prepare themselves for counter-attck. As Liu Bei’s forces were tired, they moved into the forest and Lu Xun just barbecued them. In Kingdom Wars, Lu Xun can activate “Scrutinize” and order his allies to “wait at leisure while the enemy labors (以逸待勞)”, optimizing their cards to bolster their defense, as well as preparing a counter-attack.